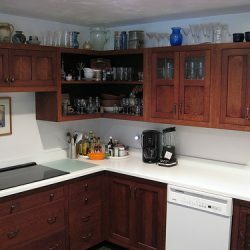 When remodeling your bathroom, you have many material options available to consider. Many homeowners in Manhattan, Queens, Brooklyn and surrounding areas are drawn to tile as a durable, decorative material in bathrooms, but there are an extensive range of tile options to consider. 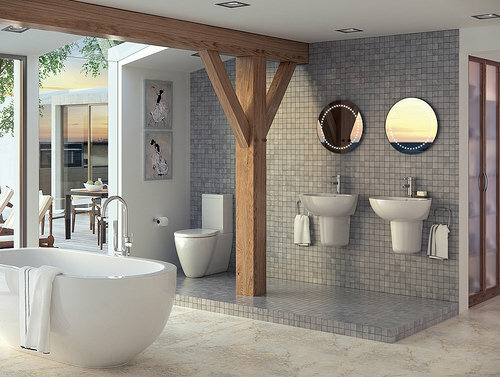 Ceramic tile in bathroom decor is among the more popular options, and there are many advantages associated with using ceramic tiles in this area of the home. However, the material is not without its downsides, and it is important to understand both the pros and cons of ceramic tile before you make a final decision about which materials to use with your remodeling project. In homes from Queens and Brooklyn to Manhattan and more, the interior decor can vary drastically. Some homeowners want to remodel their bathrooms to create a modern or contemporary look. Others prefer a zen-like ambiance, and still others may want to create an almost Romanesque look in their space. These are only a few design possibilities, and the good news is that ceramic tile in bathroom decor can be used to bring all of these design possibilities to life. This is because there is an almost endless range of colors, sizes, shapes and even textures of ceramic tile to choose from. Tile is commonly used on many surfaces in a bathroom. Heavier tiles may be easy to install on floors, but when you are applying them to walls, back splashes and even ceilings, the tile becomes much more difficult to install properly. Ceramic tile in bathroom decor is popular because it is a lightweight material that can easily be installed on vertical surfaces. The downside, however, is the fact that ceramic tile is not as strong as some other types of tile that you have access to. 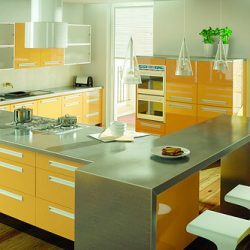 Therefore, many homeowners in Manhattan, Queens, Brooklyn and other areas who are remodeling may choose to use ceramic on vertical services that will not be heavily tread upon, and they may use other materials for flooring surfaces. The price of tile can run the gamut, and some may be priced for one to two dollars per square foot while others may be priced at $20 or more per square foot. Ceramic tile is often a popular choice in the bathroom as well as throughout the home because it is among the most affordable options. While affordable, it typically does not lack in style. Once your newly remodeled bathroom is completed, you will need to care for it on a regular basis. Cleaning tile can be burdensome, but some tile is easier to clean than others. The finish on ceramic tile in bathroom decor can vary drastically, so you may consider paying attention to things like groove and texture when selecting tile. Smooth tile is generally easier to clean, and it may be more suitable for use in areas of the bathroom that may become dirtier with regular use. For example, smoother tiles that lack significant texture are more well suited in showers or as a bathtub back splash. 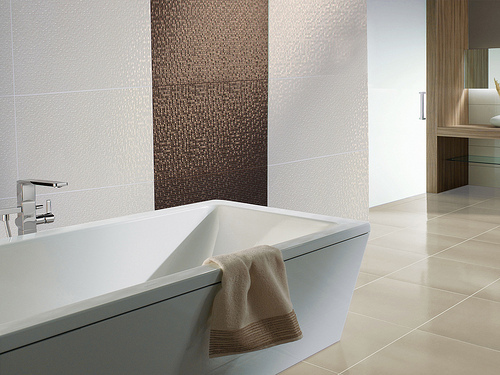 Ceramic tile in your bathroom can be used in combination with other materials with great results. For example, it can be used in combination with other types of tile so that you can take advantage of the benefits of ceramic tile while decreasing the drawbacks or downsides associated with it. Whether you have plans to remodel a small area in your bathroom in Manhattan, Queens or Brooklyn or you are renovating the entire space, it is important to think about factors like cost, style and care when selecting materials. When you analyze all of the options, you may find that ceramic tile is a great material to use in certain areas of your bathroom.